n one-way or another, we've all grown up with Time, Inc. Your family may have subscribed to Life Magazine, Time, or People; and your dad may have subscribed to Sports Illustrated, or Fortune, depending on his interests. Surely, you couldn't visit a doctor's office without leafing through one of their publications. Personally, I've been working for them (in a roundabout way) for years with my graphic design business. My firm creates advertising spreads for several of their publications. This isn't too surprising since Time, Inc. publishes approximately 130 magazines, which are read more than 300 million times worldwide on a monthly basis, and account for nearly a quarter of total advertising revenues of U.S. consumer magazines. So, when picking out our lineup for our 'Big House' issue, Ann S. Moore was a natural contact. She's been one of the '50 Most Powerful Women in American Business' for six years straight, and has been the chairman and chief executive officer of Time Inc. since July 2002. A native of McLean, VA, Moore graduated from Vanderbilt University in 1971 and received her M.B.A. from Harvard Business School in 1978. She joined Time Inc. later that year. Moore serves on the board of directors of Avon Products, Inc. and the Wallace Foundation. 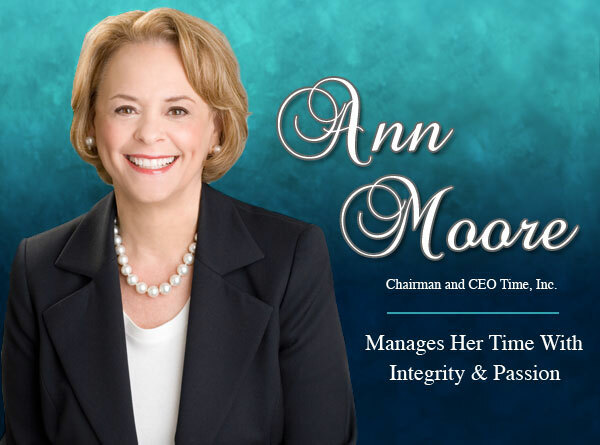 Join us in a rare and enlightening interview with Ann Moore, the dynamic woman behind Time Inc., as she discusses the secrets of her success and why you, as a freelance writer, should take pride in your online clips! WOW: We've noticed the recent revamp of time.com - congratulations! What made you decide to accelerate your focus on digital media? ANN: We've actually been focusing on our digital strategy for some time, investing in our online assets since 2000. However, we've recently made noticeable changes on our sites such as the revamped TIME.com. The new site includes features like "The Ag," an aggregation and summary of the most important news stories every day by 7 AM, a series of new blogs and the entire TIME archive of stories and covers, going all the way back to the magazine's 1923 debut issue. WOW: That's fantastic! I'm especially impressed that you've chosen to archive TIME's covers. I'm sure all of our readers will have their own favorites that they'd like to look up - I know I do. In your recent keynote speech at SIIA, you'd said, "I actually feel embarrassed that we haven't failed more often. It means we haven't tried more around the edges." In that quote you were referring to the decision to pull the plug on officepirates.com; but what do you consider as "the edges?" ANN: I believe "the edges" refers to launching an idea and concept where we don't have enough previous experience to know we have a hit on our hands. I believe all new launches need to be differentiated from anything else in the marketplace if they are going to be big businesses. You can't be afraid of taking risks! WOW: We definitely know about that one firsthand. Since WOW! launched in September 2006, we've seen a growth of over six million in our numbers. Do you think that online readers are fickle, or that a type of old-fashioned print magazine loyalty is gaining momentum in online publications? ANN: I think that there is so much information online, that people will look for trusted brands to cut through the clutter. We believe that our trusted content will be valuable in a digital world and that consumers will bookmark their favorite web sites. WOW: At WOW! we know that on average 80% of our readers bookmark our site on a monthly basis. In your opinion, what do you find earns the high bookmark ratings for online publications? ANN: For Time Inc., it's the same quality content that draws readers to our print publications. We have recognizable names like Sports Illustrated, Time and People that consumers trust, both in print and online. It's that recognition and trust that will make them bookmark the web site and come back regularly. WOW: How will the content of your publications differ in print and online? ANN: While the same quality of writing and editing apply to both print and online, we realize that our web site content should be shorter, extremely up-to-date and engage readers in a unique way. WOW: Back in the day, even five years ago, freelance writers and journalists didn't consider themselves 'published' unless they were in print. Now with the growth of digital media, freelancers are embracing their online publishing credits. As a magazine publisher, do you think that a writer's online clips carry more weight now than previously? ANN: The print and online worlds are definitely no longer separated for journalists. Time Inc.'s biggest names in print are now writing for the web as well, and recognize it's a great way to have more articles published and seen by a growing audience. WOW: I'm sure our freelancers will be happy to hear that. Ann, we admire the work that you do with Avon Products, Inc., which helps to empower women, and with The Wallace Foundation, which supports arts and education. Could you describe corporate responsibility and its importance in the business world today? ANN: I believe a company's values should reflect those of their employees. I'm proud to work for a company whose employees donate substantial money each year to non-profits and more than 250,000 hours a year for various causes. In fact, we believe so strongly in public service that we created the annual Andrew Heiskell Community Service Awards, named after a former Time Inc. Chairman to honor employees who have done great work in education and literacy, youth mentoring and other areas of community service. Our annual "Time To Give Back Campaign" raises nearly a million dollars each year for a variety of worthy organizations. We have employees who desperately want to give back to the community and I believe it is our role as a company to organize them and enable them to do this. WOW: That's wonderful, I would think it makes your employees feel like part of the family to give back as well, which brings me to my next question. . . Over the years, you managed to balance your family life as a mother and a wife, as well as your dynamic career life. You are quite an amazing woman! How did you manage to blend your work and home life? ANN: It's a fact: Holding a powerful position requires an organizational commitment and long hours leading to constant trade offs for spouse and children. While I take great pride in my career I also realize that power isn't everything and it's important for women to find their own balance and be happy. WOW: In your experience, what are the fundamental differences between the way men and women conduct business? ANN: There are fundamental differences between men and women. I believe the workplace is better today because it's more diverse. Diversity matters, not just in terms of gender or race, but in how people think about problems and their solutions. WOW: One major solution for you was deciding to take the job at Time, after graduating from Harvard Business School. The position was lower paying than other job offers, but you took it because of your passion for magazines. How has staying true to your integrity helped you throughout the years? ANN: Selecting an industry I was truly passionate about is really the secret of my success. I love the publishing business as much today as I did thirty years ago. Always remember, where you're headed is much more important than how fast you're going! WOW: That's great advice! Many times, as businesswomen, we move so fast that we almost forget to slow down. What role does stepping away to rejuvenate the soul play in a businesswoman's/writer's life? ANN: Everyone needs to recharge their batteries. I spend my weekends reading, cooking, gardening and keeping as far away from my computer as I can! WOW: I hear that one! Among many things, we love your new ideas for focusing your content online. May we tap your experience and heart, by asking you what ingredients are essential to creating a successful writing & reading e-zine? ANN: It's very similar to the ingredients offline. Pick a topic you are truly passionate about, assemble the best team and listen to your audience. WOW: Thank you for sharing your wisdom with WOW! and our readers. This will surely be an interview to bookmark. What you have done to encourage the upcoming writers to ply their wares online, will earn kudos for you, for a long time to come. Some of this talent will undoubtedly make its way to your domain of digital media, and we can only hope, WOW! We will all be keeping our eyes opened to catch Time Inc.'s launches from "the edges."